Before you start buying and planting trees and shrubs, you must have a firm grasp of your yard. Consider both the direction of the slope and its relative angle. For example, a slope that goes towards your home at a steep angle may cause issues from water flowing into your basement or ground floor. Also think about how the wind might impact your yard. If a shrub or tree gets knocked over, could it cause damage to other plant life? If the slope goes away from your home, there might be things near your house that could roll down and damage areas of the yard. This is especially important to consider if you plan to grow flowers or vegetables. From there, you want to do the same kind of evaluation as you would with a normal yard. That means testing the soil, understanding where moisture tends to build up, and determining what type of natural fertilizers you’ll need to facilitate plant life. A sloped yard may give you some limitations on spacing and placement, but you should still be able to get most of the things you want in the yard - you just may need to organize it a bit differently. For example, if you want a sitting area where you can relax and entertain guests, it might need to be placed closer to your home, especially if your slope goes uphill away from your yard. This can provide some excellent scenery to enjoy while sitting in your yard. The same principle applies if you need a place for children or pets to play, or if you are creating a natural space for animals like a birdbath. It helps if you have at least a rough diagram of the way you want your yard arranged, with various types of spaces labeled. 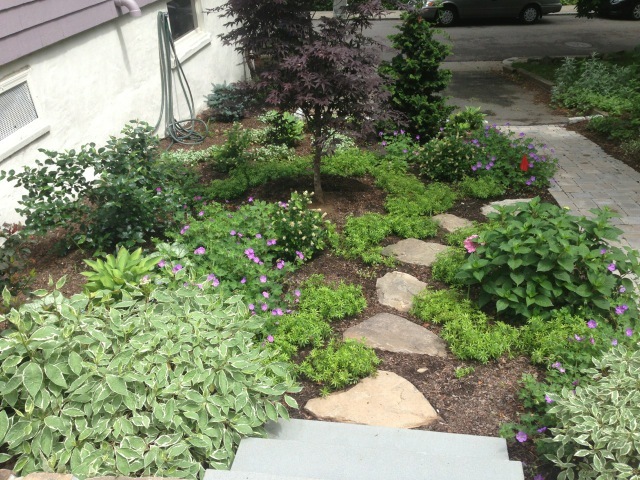 When most people think of sloped yards, they imagine hardscaping as a way to separate each level. While this can be a nice way to design your yard, it’s not fully necessary to add expensive concrete steps or walls. 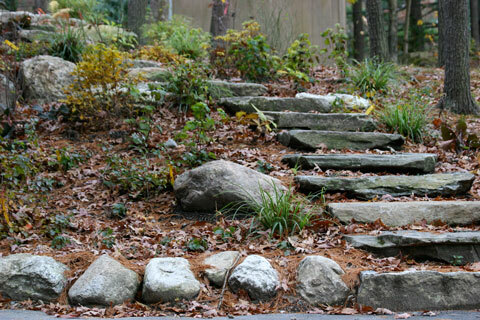 Depending on your yard, you can make do by stabilizing boulders and large rocks. You could also build terraces in certain areas, with smaller sets of natural steps to separate them from the main yard. You’ve got to be consider the flow of water when you plan a sloped yard. As mentioned, the downward flow of rain or runoff from a nearby lake or stream could make your home more vulnerable to flooding than a typical house. On the other hand, a sloped yard is usually excellent for drip irrigation, because you can use gravity to move water. When it comes to planting for slopes, it’s usually best to emphasize shorter plants that are closer to the ground. However, this isn’t a hard-and-fast rule - you can also use taller shrubs and trees, they just have to be placed strategically. Rhus aromatica is one of our favorite examples of shorter plants that look beautiful on a sloped yard. Others include symphoricarpos and juniper carpets. Try to incorporate native plants such as bearberry, which grows beautiful red and dark purple berries. To make planting less difficult on a slope, consider using jute netting. This organic mesh decomposes naturally in the ground over time, and will make it easier for plants to maintain stability even if the force of gravity is pulling on them. While having different elevations in your yard may seem like a difficult challenge, it doesn’t need to be. With some planning and visualization, plus selection of the right plants, you can easily build a gorgeous yard, even if it’s spread across multiple levels. For help designing an attractive yard on a slope, contact us today.